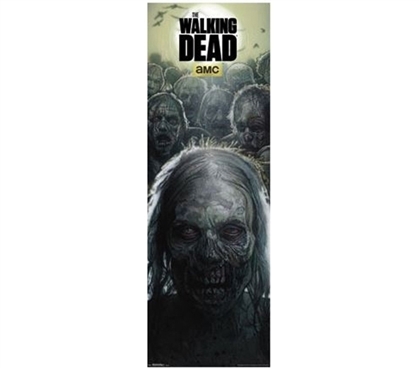 A huge Walking Dead poster sounds like just the perfect dorm item for your college decorations if you want something that's different and even downright creepy! Yet this Door - Walking Dead - Zombies Poster makes having an oversized zombie as part of your dorm decor a cool thing, actually. When you shop for college, don't be shy about including college decorations, especially cheap posters. And with this door poster, it'll be, as its name implies, large enough to drape on your door, making it even scarier and more lifelike! Hey, if it creeps you out a bit, then consider this college poster as just doing its job, and you can always hide under your twin XL comforter and dorm sheets to stay safe. In all seriousness, this is the sort of dorm decoration to have some fun with!